There are many excellent resources for learning about Colorado’s great birding opportunities. Here is a list of 9 of my personal favorites. I don’t intend this to be an exhaustive list–just a sampling of the books and online resources I use most often. And I would be remiss if I didn’t mention all the knowledgeable and friendly Colorado birders who have welcomed me and willingly shared their time and expertise. Thank you all! 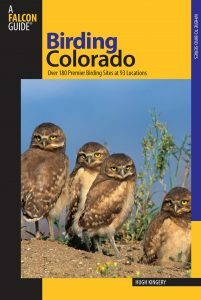 One: Birding Colorado: Over 180 Premier Birding Sites At 93 Locations by Hugh Kingery. This 336 page guide is part of the excellent Falcon Guides series. 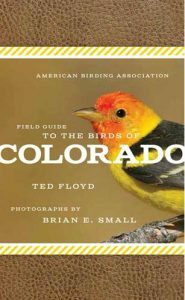 It includes detailed maps and suggestions on how to bird the top sites throughout Colorado plus a summary of exactly where and when to find the specialty species. Whether you live in Colorado or planning a birding trip, this is an essential guide. Two: A Birder’s Guide to Colorado (ABA/Lane Birdfinding Guide) by Harold Holt. This classic is no longer in print but the most recent edition from 1997 is widely available from used booksellers. Almost 400 pages and crammed full of maps, detailed itineraries, bird-finding strategies, and more, this is another essential resource for any Colorado birder. FIVE: I always keep a copy of the DeLorme Colorado Atlas and Gazetteer in my car. These maps cover the entire state, offer great detail, and clearly mark nearly all of the public land which covers includes all the birding hotspots mentioned in the books above. This is extra helpful since there are many places where you won’t get cell phone service and can’t just look up your location on your phone. SIX: Colorado Field Ornithologists (CFO) maintains a comprehensive page of online birding resources. 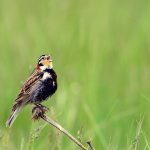 Here you’ll find links to the bird clubs and Audubon groups in Colorado, various Colorado birding sites, and much more. My favorite reference is probably the amazing Colorado County Birding site which truly does list the best birding spots in each of Colorado’s 64 counties. The amount of time it has taken to compile all this info is astounding and it’s a wonderful help to any local or visiting birder. SEVEN: One important site I check nearly every day is COBIRDS. This is a Google Group (essentially a listserv) with reports on the latest bird sightings plus comments and questions submitted by users. You can visit and read the site or join the group to submit your own reports and receive emails when news is posted. 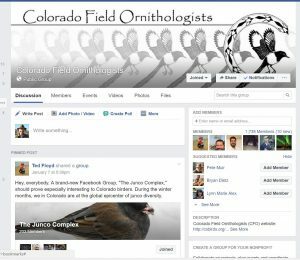 EIGHT: For Facebook users, you will want to check out the Colorado Field Ornithologists page and Denver Field Ornithologists (DFO.) Both are good places to learn, ask questions, and get connected with other birders. In addition to the free online information, both CFO and DFO are membership organizations that you can join for even more benefits. NINE: Finally, eBird has been invaluable in helping me plan trips and find birds in Colorado. Their Hotspot Explorer and Explore a Region functions maps the best birding spots and the Bar Chart function can be customized to show which species can be expected at each location for any month of the year and even includes a link to view specific recent reports for each species. It’s a great tool and here is a summary of these functions. BONUS: I’ve recently stumbled across Rocky Mountain Birds: Birds and Birding in the Central and Northern Rockies by Paul A. Johnsgard. This 274 page book was published in 2011 and is available as a FREE download from DigitalCommons@University of Nebraska – Lincoln. (I know…FREE DOWNLOAD often sounds like a gimmick but this really is available as a full download of the entire book.) 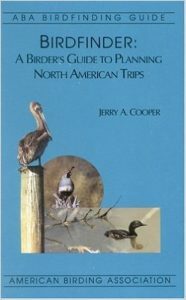 Johnsgard begins with a clear and thorough account of the habitats, ecology and bird geography in the Rocky Mountains followed by descriptions of all the major birding hotspots and a complete set of species accounts with tips on locating each species. I plan to spend more time with this resource! 2019 © Colorado Birding Adventures No images or content may be used or duplicated without permission.